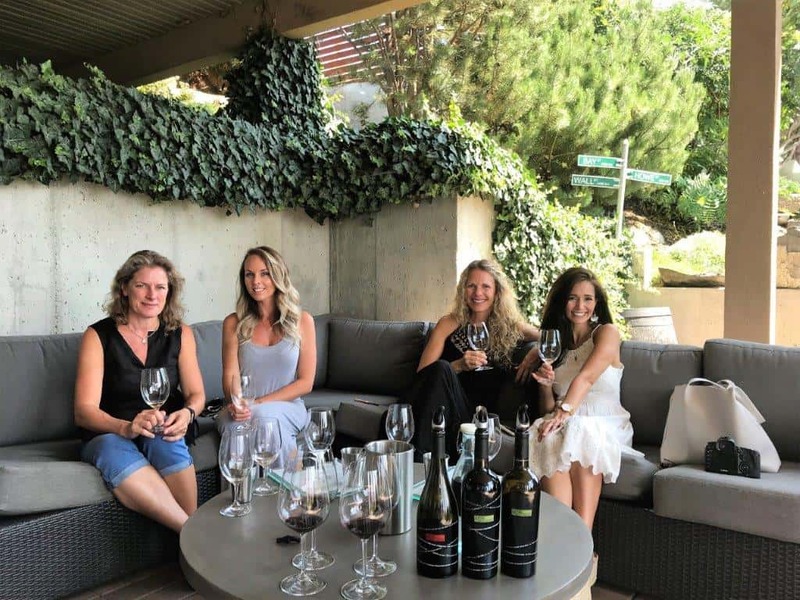 Last week Wines of British Columbia had the opportunity to tour around the Okanagan Valley with Fraiche Nutrition’s Tori Wesszer in search of the Best of BC Wine Country. Beginning the day at 9:00 AM we were able to visit five wineries from West Kelowna to the Naramata Bench, finishing the day with a beautiful dinner on the Old Vines Restaurant patio soaking up the lake views overlooking the vineyards at Quails’ Gate Winery (140km round-trip). “The wine industry in BC has absolutely boomed, it’s been so much fun watching the evolution of the wineries over the years – and there’s so much more than just wine to be enjoyed at these wineries!” – Tori Wesszer, Fraiche Nutrition. Along the way we stopped at Fitzpatrick Family Vineyards at Greata Ranch between Peachland and Summerland for a taste of their award-winning sparkling wines, recently winning Gold at the National Wine Awards of Canada, followed by a tour of the impressive sparkling wine caves beneath the tasting room. 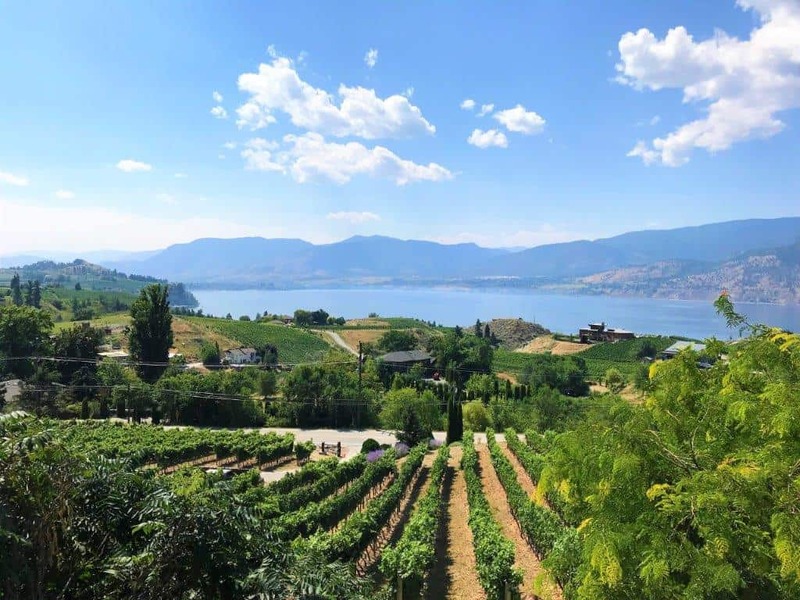 We continued on to the Naramata Bench, home to more than 43 wineries along a 14 km stretch of road, also accessible from the KVR trail where many fitness enthusiasts will come from by bicycle. Our first stop on the Naramata Bench was JoieFarm where we met with owner, winemaker and chef Heidi Noble, and her team as she chatted to us about her passion for wine and food from behind the line creating local, fresh from the garden shareable plates perfectly paired with her food-friendly wines which we enjoyed while playing a game of bocce ball in the vineyard. There are more than 155 winery picnic licenses in BC – offering the perfect alternative to enjoy wine and food pairings without the time commitment. Next, we arrived at Laughing Stock Vineyards, where founder Cynthia Enns joined us for a private tasting through their award-winning portfolio of red and white wines. If you are looking for a quiet, relaxing and informative tasting, there are many BC wineries offering these kinds of private tastings guided by sommeliers and/or trained staff. The options of where to go for lunch in the Okanagan Valley are endless! 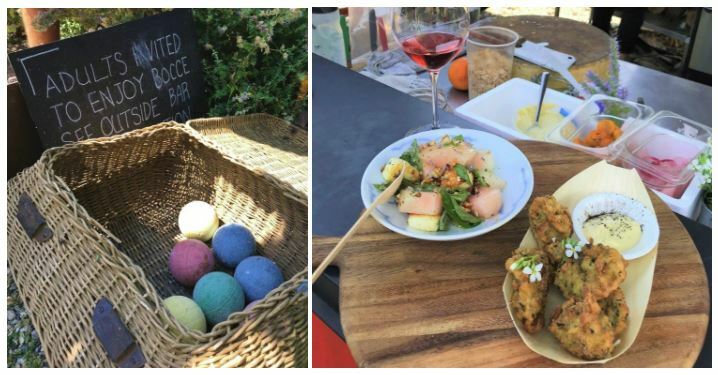 With more than 47 on-site winery restaurants in BC, Tori chose the Pecking Room at Red Rooster Winery for their amazing patio vibes and perfectly-paired wines to compliment the fresh local ingredients prepared by celebrated Penticton-based chef Darin Paterson. “British Columbia wineries are truly one of the most interesting places to visit. From local gourmet food trucks and restaurants, boutique accommodations, artisan shopping and world-class lake views, every winery is different and offers a rich and unique experience.” – Tori, Fraiche Nutrition. If you’re looking for winery restaurants, picnic areas, accommodations or special winery events in your region download the Wine BC Trip Planner App and use the filters to find your next winery experience. You can also download Tori’s full wine tour itinerary here by creating your own Wine BC Trip Planner account. Check out Tori’s full blog and photos from her BC wine tour on Fraiche Nutrition. d tourism. Check back to the Bestof.WineBC.com on September 13, 2018 to find out the winners of the 2018 Best of BC Wine Country Awards.